This article is about the hair care product. For other uses, see Shampoo (disambiguation). 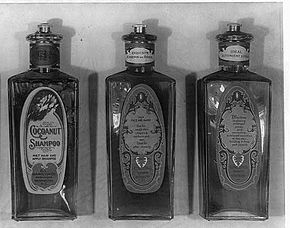 Bottles of shampoo and lotions manufactured in the early 20th century by the C.L. Hamilton Co. of Washington, D.C. The typical reason of using shampoo is to remove the unwanted build-up of sebum in the hair without stripping out so much as to make hair unmanageable. Shampoo is generally made by combining a surfactant, most often sodium lauryl sulfate or sodium laureth sulfate, with a co-surfactant, most often cocamidopropyl betaine in water. Specialty shampoos are available for people with dandruff, color-treated hair, gluten or wheat allergies, an interest in using an organic product, and infants and young children ("baby shampoo" is less irritating). There are also shampoos intended for animals that may contain insecticides or other medications to treat skin conditions or parasite infestations such as fleas. The word shampoo entered the English language from the Indian subcontinent during the colonial era. It dates to 1762 and is derived from Hindi chāmpo (चाँपो [tʃãːpoː]), itself derived from the Sanskrit root chapati (चपति), which means to press, knead, soothe. In the Indian subcontinent, a variety of herbs and their extracts have been used as shampoos since ancient times. A very effective early shampoo was made by boiling Sapindus with dried Indian gooseberry (amla) and a selection of other herbs, using the strained extract. Sapindus, also known as soapberries or soapnuts, a tropical tree widespread in India, is called ksuna (Sanskrit: क्षुण) in ancient Indian texts and its fruit pulp contains saponins which are a natural surfactant. The extract of soapberries creates a lather which Indian texts called phenaka (Sanskrit: फेनक). It leaves the hair soft, shiny and manageable. Other products used for hair cleansing were shikakai (Acacia concinna), hibiscus flowers, ritha (Sapindus mukorossi) and arappu (Albizzia amara). Guru Nanak, the founding prophet and the first Guru of Sikhism, made references to soapberry tree and soap in the 16th century. Cleansing with hair and body massage (champu) during one's daily bath was an indulgence of early colonial traders in India. When they returned to Europe, they introduced the newly learned habits, including the hair treatment they called shampoo. Sake Dean Mahomed, a Bengali traveller, surgeon, and entrepreneur, is credited with introducing the practice of champooi or "shampooing" to Britain. In 1814, Mahomed, with his Irish wife Jane Daly, opened the first commercial "shampooing" vapour masseur bath in England, in Brighton. He described the treatment in a local paper as "The Indian Medicated Vapour Bath (type of Turkish bath), a cure to many diseases and giving full relief when everything fails; particularly Rheumatic and paralytic, gout, stiff joints, old sprains, lame legs, aches and pains in the joints". During the early stages of shampoo in Europe, English hair stylists boiled shaved soap in water and added herbs to give the hair shine and fragrance. Commercially made shampoo was available from the turn of the 20th century. A 1914 advertisement for Canthrox Shampoo in American Magazine showed young women at camp washing their hair with Canthrox in a lake; magazine advertisements in 1914 by Rexall featured Harmony Hair Beautifier and Shampoo. Originally, soap and shampoo were very similar products; both containing the same naturally derived surfactants, a type of detergent. Modern shampoo as it is known today was first introduced in the 1930s with Drene, the first shampoo using synthetic surfactants instead of soap. Early shampoos used in Indonesia were made from the husk and straw (merang) of rice. The husks and straws were burned into ash, and the ashes (which have alkaline properties) are mixed with water to form lather. The ashes and lather were scrubbed into the hair and rinsed out, leaving the hair clean, but very dry. Afterwards, coconut oil was applied to the hair in order to moisturize it. Before quinoa can be eaten the saponin must be washed out from the grain prior to cooking. Pre-Columbian Andean civilizations used this soapy by-product as a shampoo. Many shampoos are pearlescent. This effect is achieved by the addition of tiny flakes of suitable materials, e.g. glycol distearate, chemically derived from stearic acid, which may have either animal or vegetable origins. Glycol distearate is a wax. Many shampoos also include silicone to provide conditioning benefits. Sodium laureth sulfate is derived from coconut oils and is used to soften water and create a lather. There was some concern over this particular ingredient circa 1998 as evidence suggested it might be a carcinogen, and this has yet to be disproved, as many sources still describe it as irritating to the hair and scalp. Sodium lauroamphoacetate is naturally derived from coconut oils and is used as a cleanser and counter-irritant. This is the ingredient that makes the product tear-free. Polysorbate 20 (abbreviated as PEG(20)) is a mild glycol-based surfactant that is used to solubilize fragrance oils and essential oils, meaning it causes liquid to spread across and penetrate the surface of a solid (i.e. hair). Polysorbate 80 (abbreviated as PEG(80)) is a glycol used to emulsify (or disperse) oils in water (so the oils do not float on top like Italian salad dressing). PEG-150 distearate is a simple thickener. Citric acid is produced biochemically and is used as an antioxidant to preserve the oils in the product. While it is a severe eye-irritant, the sodium lauroamphoacetate counteracts that property. Citric acid is used to adjust the pH down to approximately 5.5. It is a fairly weak acid which makes the adjustment easier. Shampoos usually are at pH 5.5 because at slightly acidic pH, the scales on a hair follicle lie flat, making the hair feel smooth and look shiny. It also has a small amount of preservative action. Citric acid, as opposed to any other acid, will prevent bacterial growth. Quaternium-15 is used as a bacterial and fungicidal preservative. Polyquaternium-10 has nothing to do with the chemical quaternium-15; it acts as the conditioning ingredient, providing moisture and fullness to the hair. Methylisothiazolinone, or MIT, is a powerful biocide and preservative. In the United States, the Food and Drug Administration (FDA) mandates that shampoo containers accurately list ingredients on the products container. The government further regulates what shampoo manufacturers can and cannot claim as any associated benefit. Shampoo producers often use these regulations to challenge marketing claims made by competitors, helping to enforce these regulations. While the claims may be substantiated, however, the testing methods and details of such claims are not as straightforward. For example, many products are purported to protect hair from damage due to ultraviolet radiation. While the ingredient responsible for this protection does block UV, it is not often present in a high enough concentration to be effective. The North American Hair Research Society has a program to certify functional claims based on third-party testing. Shampoos made for treating medical conditions such as dandruff or itchy scalp are regulated as OTC drugs in the US marketplace. In the European Union, there is a requirement for the anti-dandruff claim to be substantiated as with any other advertising claim, but it is not considered to be a medical problem. A number of contact allergens are used as ingredients in shampoos, and contact allergy caused by shampoos is well known. Patch testing can identify ingredients to which patients are allergic, after which a physician can help the patient find a shampoo that is free of the ingredient to which they are allergic. The US bans 11 ingredients from shampoos, Canada bans 587, and the EU bans 1328. Cosmetic companies have developed shampoos specifically for those who have dandruff. These contain fungicides such as ketoconazole, zinc pyrithione and selenium disulfide, which reduce loose dander by killing fungi like Malassezia furfur. Coal tar and salicylate derivatives are often used as well. Alternatives to medicated shampoos are available for people who wish to avoid synthetic fungicides. Such shampoos often use tea tree oil, essential oils or herbal extracts. Many companies have also developed color-protection shampoos suitable for colored hair; some of these shampoos contain gentle cleansers according to their manufacturers. Many people suffer from eczema on their palms and their head. Some find that wheat or gluten — the protein found in many grains including wheat — is the cause, particularly if they are sensitive to foods containing gluten. Shampoo can inadvertently enter the mouth, particularly among children, so all individuals who are on gluten-free diets may prefer to use a gluten-free shampoo. Shampoo manufacturers are starting to recognize this and gluten-free and wheat-free products are now available. Triticum vulgare (wheat), hordeum vulgare (barley), secale cereale (rye), or avena sativa (oats), including any oil, protein, hydrosylate, or other extract from any part of the plant. "Fragrance" is a broad category that may contain many chemicals that are otherwise unlisted on the label. Shampoo for infants and young children is formulated so that it is less irritating and usually less prone to produce a stinging or burning sensation if it were to get into the eyes. For example, Johnson's Baby Shampoo advertises under the premise of "No More Tears". This is accomplished by one or more of the following formulation strategies. The distinction in 4 above does not completely surmount the controversy over the use of shampoo ingredients to mitigate eye sting produced by other ingredients, or the use of the products so formulated. The considerations in 3 and 4 frequently result in a much greater multiplicity of surfactants being used in individual baby shampoos than in other shampoos, and the detergency or foaming of such products may be compromised thereby. The monoanionic sulfonated surfactants and viscosity-increasing or foam stabilizing alkanolamides seen so frequently in other shampoos are much less common in the better baby shampoos. Shampoo intended for animals may contain insecticides or other medications for treatment of skin conditions or parasite infestations such as fleas or mange. These must never be used on humans. While some human shampoos may be harmful when used on animals, any human haircare products that contain active ingredients or drugs (such as zinc in anti-dandruff shampoos) are potentially toxic when ingested by animals. Special care must be taken not to use those products on pets. Cats are at particular risk due to their instinctive method of grooming their fur with their tongues. Shampoos that are especially designed to be used on pets, commonly dogs and cats, are normally intended to do more than just clean the pet's coat or skin. Most of these shampoos contain ingredients which act differently and are meant to treat a skin condition or an allergy or to fight against fleas. The main ingredients contained by pet shampoos can be grouped in insecticidals, antiseborrheic, antibacterials, antifungals, emollients, emulsifiers and humectants. 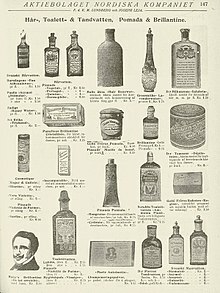 Whereas some of these ingredients may be efficient in treating some conditions, pet owners are recommended to use them according to their veterinarian's indications because many of them cannot be used on cats or can harm the pet if it is misused. Generally, insecticidal pet shampoos contain pyrethrin, pyrethroids (such as permethrin and which may not be used on cats) and carbaryl. These ingredients are mostly found in shampoos that are meant to fight against parasite infestations. Antifungal shampoos are used on pets with yeast or ringworm infections. These might contain ingredients such as miconazole, chlorhexidine, providone iodine, ketoconazole or selenium sulfide (which cannot be used on cats). Bacterial infections in pets are sometimes treated with antibacterial shampoos. They commonly contain benzoyl peroxide, chlorhexidine, povidone iodine, triclosan, ethyl lactate, or sulfur. Antipruritic shampoos are intended to provide relief of itching due to conditions such as atopy and other allergies. These usually contain colloidal oatmeal, hydrocortisone, Aloe vera, pramoxine hydrochloride, menthol, diphenhydramine, sulfur or salicylic acid. These ingredients are aimed to reduce the inflammation, cure the condition and ease the symptoms at the same time while providing comfort to the pet. Antiseborrheic shampoos are those especially designed for pets with scales or those with excessive oily coats. These shampoos are made of sulfur, salicylic acid, refined tar (which cannot be used on cats), selenium sulfide (cannot be used on cats) and benzoyl peroxide. All these are meant to treat or prevent seborrhea oleosa, which is a condition characterized by excess oils. Dry scales can be prevented and treated with shampoos that contain sulfur or salicylic acid and which can be used on both cats and dogs. Emollient shampoos are efficient in adding oils to the skin and relieving the symptoms of a dry and itchy skin. They usually contain oils such as almond, corn, cottonseed, coconut, olive, peanut, Persia, safflower, sesame, lanolin, mineral or paraffin oil. The emollient shampoos are typically used with emulsifiers as they help distributing the emollients. These include ingredients such as cetyl alcohol, laureth-5, lecithin, PEG-4 dilaurate, stearic acid, stearyl alcohol, carboxylic acid, lactic acid, urea, sodium lactate, propylene glycol, glycerin, or polyvinylpyrrolidone. Although some of the pet shampoos are highly effective, some others may be less effective for some condition than another. Yet, although natural pet shampoos exist, it has been brought to attention that some of these might cause irritation to the skin of the pet. Natural ingredients that might be potential allergens for some pets include eucalyptus, lemon or orange extracts and tea tree oil. On the contrary, oatmeal appears to be one of the most widely skin-tolerated ingredients that is found in pet shampoos. Most ingredients found in a shampoo meant to be used on animals are safe for the pet as there is a high likelihood that the pets will lick their coats, especially in the case of cats. Pet shampoos which include fragrances, deodorants or colors may harm the skin of the pet by causing inflammations or irritation. Shampoos that do not contain any unnatural additives are known as hypoallergenic shampoos and are increasing in popularity. Solid shampoos or shampoo bars use as their surfactants soaps or other surfactants formulated as solids. They have the advantage of being spill-proof. They are easy to apply; one may simply rub the bar over wet hair, and work the soaped hair into a low lather. Stiff, non-pourable clear gels to be squeezed from a tube were once popular forms of shampoo, and can be produced by increasing a shampoo's viscosity. This type of shampoo cannot be spilled, but unlike a solid, it can still be lost down the drain by sliding off wet skin or hair. Shampoos in the form of pastes or creams were formerly marketed in jars or tubes. The contents were wet but not completely dissolved. They would apply faster than solids and dissolve quickly. Antibacterial shampoos are often used in veterinary medicine for various conditions, as well as in humans before some surgical procedures. Closely associated with environmentalism, the "no poo" movement consists of people rejecting the societal norm of frequent shampoo use. 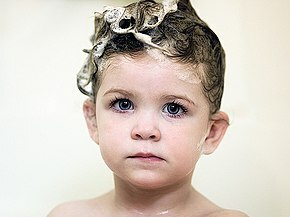 Some adherents of the no poo movement use baking soda or vinegar to wash their hair, while others use diluted honey. Other people use nothing, rinsing their hair only with conditioner. In the 1970s, ads featuring Farrah Fawcett and Christie Brinkley asserted that it was unhealthy not to shampoo several times a week. This mindset is reinforced by the greasy feeling of the scalp after a day or two of not shampooing. Using shampoo every day removes sebum, the oil produced by the scalp. This causes the sebaceous glands to produce oil at a higher rate, to compensate for what is lost during shampooing. According to Michelle Hanjani, a dermatologist at Columbia University, a gradual reduction in shampoo use will cause the sebum glands to produce at a slower rate, resulting in less grease in the scalp. Although this approach might seem unappealing to some individuals, many people try alternate shampooing techniques like baking soda and vinegar in order to avoid ingredients used in many shampoos that make hair greasy over time. ^ M. J. Campion, Hobson-Jobson: The words English owes to India. BBC News, 11 July 2012. ^ chāmpo (चाँपो [tʃãːpoː]) is the imperative of chāmpnā (चाँपना [tʃãːpnaː]), "to smear, knead the muscles, massage the head and hair". ^ American Heritage Dictionary of the English Language, 4th Edition, See Shampoo; Also see Shampoo. Hobson-Jobson (1903), University of Chicago. ^ Sanskrit Lexicon, University of Koeln, Germany, see चपयति (2008). ^ Shampoo, Etymology Dictionary (2006). ^ Teltscher, Kate (2000). "The Shampooing Surgeon and the Persian Prince: Two Indians in Early Nineteenth-century Britain". Interventions: International Journal of Postcolonial Studies. 2 (3): 409–23. doi:10.1080/13698010020019226. ^ Victoria Sherrow, Encyclopedia of hair: a cultural history, 2006 s.v. "Advertising" p. 7. ^ "From Pert: Do You Wash and Go?". Company Science Behind the Brands. Procter and Gamble. Archived from the original on 2007-02-16. Retrieved 2007-03-26. ^ "Agar RAMBUT Selalu Sehat". Kompas Cyber Media. 2004-04-11. Archived from the original on 2007-03-12. Retrieved 2007-03-26. ^ ChemViews (2012). "Shampoo Science". ChemViews. doi:10.1002/chemv.201200149. ^ See FDA OTC (Nonprescription) Drugs Approval Process for information. ^ Schlanger, Zoe (27 June 2017). "Will your shampoo make your hair fall out? The US government isn't sure". Quartz (publication). Retrieved 27 June 2017. ^ Aburjai, Talal; Natsheh, Feda M. (November 2003). "Plants used in cosmetics". Phytotherapy Research. 17 (9): 987–1000. doi:10.1002/ptr.1363. PMID 14595575. ^ "Atopic eczema – NHS Choices". Nhs.uk. Retrieved 2012-04-25. ^ "A list of items with hidden gluten". ^ "Campaign for Safe Cosmetics : Fragrance". Safecosmetics.org. Archived from the original on 2012-05-11. Retrieved 2012-04-25. ^ "Dog Shampoos: The Function of Common Ingredients". Retrieved 2010-06-11. ^ "Common Canine Skin Irritants". Retrieved 2010-06-11. ^ Guaguere, E. (1996). "Topical treatment of canine and feline pyoderma". Veterinary Dermatology. 7 (3): 145–151. doi:10.1111/j.1365-3164.1996.tb00239.x. ^ Mueller, R. S. (2004). "Treatment protocols for demodicosis: an evidence-based review". Veterinary Dermatology. 15 (2): 75–89. doi:10.1111/j.1365-3164.2004.00344.x. PMID 15030556. ^ Williams Iii, E. F.; Lam, S. M. (2003). "Midfacial Rejuvenation Via an Endoscopic Browlift Approach: A Review of Technique". Facial Plastic Surgery. 19 (2): 147–156. doi:10.1055/s-2003-40001. PMID 12825156. ^ Raney, J. P.; Kirk, E. A. (1988). "The use of an Ommaya reservoir for administration of morphine sulphate to control pain in select cancer patients". Journal of Neuroscience Nursing. 20 (1): 23–29. doi:10.1097/01376517-198802000-00004. PMID 2963870. ^ "How to Wash Your Hair Without Shampoo: 11 steps". wikiHow. 2012-03-20. Retrieved 2012-04-25. ^ tubular (2008-03-19). "How to Go No Poo". Instructables.com. Retrieved 2012-04-25. ^ "When It Comes To Shampoo, Less Is More". NPR. Retrieved 2012-04-25. Look up shampoo in Wiktionary, the free dictionary. McKie, Robin (2009-03-29). "Shampoo in the water supply triggers growth of deadly drug-resistant bugs". The Guardian.